So, you just brought a new Boxer puppy home and you need tips on potty training. Well, you have come to the right place! First off, Boxers are highly intelligent dogs that are known for being exceptionally clean in their living environments. This spells out to Boxers are one of the easier dog breeds to potty train. In fact, most Boxer owners will tell you that it only takes about one to two weeks with consistency and the right training. Others have even gone as far as to say they are cat-like in their cleanliness. At any rate, given consistency and the proper training, you will have your Boxer puppy potty trained in no time. The first thing to remember is that all dogs learn best through positive reinforcement. Many times owners simply want to scold their dogs for bad behavior, but forget to praise them for good behavior. Just remember to take an approach closest to what you hope to accomplish. In other words, if you hope to gain positive changes in your dog, then go about correcting the behavior with positive encouragement. Always remember that your dog’s number one goal in life is to please you. Given that, make sure you take your Boxer puppy to the same door and area of the yard each time you expect the puppy to do its business. The puppy will be intelligent enough to realize that is the gateway to the potty area. So, this does not mean that you will not have to keep an eye on your puppy, because you will! In fact, all puppies are equivalent to two year old children. In other words, it is your responsibility to keep an eye on your puppy each time he or she is out of the crate. This will not only prevent potty accidents in the house, but it will also prevent the dog from finding something in the home that is fatal or harmful to the dog’s health. When it comes to potty training, each time the puppy goes to the bathroom outside tell him or her how good they are and even reward them with a treat. This will make the dog want to use the restroom outside for the sheer enjoyment of positive attention from you. Soon, if you are repetitive and consistent enough, your Boxer will learn to go potty outside and to “hold it” when you are gone. It really helps to talk to your dog; if you get the dog used to hearing the same phrases over and over for certain actions, the dog will soon begin to associate the phrases with the actions. Then BOOM, you have a Boxer that is thoroughly potty trained. If you still need assistance on the correct ways to potty train your Boxer puppy, there are many online sites with training materials for sale. 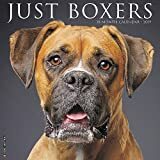 In fact, Amazon.com has a rather large collection of books associated with the training of Boxer puppies and dogs. Regardless, the method you choose the important thing is that you accomplish the feat. Once you have your dog fully housebroken you will feel less apprehensive about the dog being inside the home and you will also feel a little bit of stress associated with raising a puppy fade away. In the end, a housebroken dog can create some of the best companionship available! Are Boxers easy to Potty Train?